We visited my husband's cousin Divya last month. After dinner, as we got talking, she told me about how her friend made Shrikhand using Greek yogurt. I had seen Greek yogurt being mentioned in lots of dishes, but had never tried my hand at it. So I was excited and jumped at the idea of making Shrikand with Greek yogurt. Both of us experimented a little and with prior kowledge of how Shrikhand tastes, came up with a pretty tasty dish! Today being Krishnashtami, I thought of making it again. This time I used regular yogurt because I was curious to see how it turned out. The difference is, Greek Yogurt is already strained and thick so if you use it, you are saving yourself a great deal of time and cleaning! If you use regular yogurt you will have to hang it in a muslin cloth and leave it for a few hours till all the water (whey) drains out and you get thick yogurt called 'hung curd' or 'Chakka'. Lightly crush saffron, dissolve in milk and keep aside. In a large bowl, mix yogurt thoroughly with sugar. If the curd is sour, you may need more sugar. If you are using Greek yogurt, start with 2/3 cup of sugar and adjust accordingly. Add saffron and milk. Sprinkle the cardamom powder. Add half the quantity of nuts and mix well. Refrigerate for atleast one hour. Garnish with remaining nuts and a few saffron strands. My li'l muddu krishna enjoyed the Shrikhand! He was very curious to know what I was making. And when I gave him a small bowl of Shrikhand he gobbled it up and asked for more! Sending this to 'Flavors of Gujrat'. lovely Shrikhand... and lovely blog too! Agree with you..I tried it with greek yogurt myself n it comes out great.. Your shrikhand looks delicious! And with the greek yogurt it sounds very fast too! Happy Janmashtami to u! Yum yum shrikhand. Looks too good,sure to taste great. Click is quite tempting. Woww thats a droolworthy and tempting shrikhand..
Hi there! What an interesting recipe this is. I love the combination of ingredients and I'm sure the texture would be heavenly. 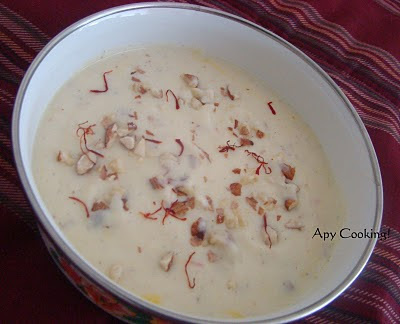 it looks simple but yummy one..
oh what a delicious and tempting shrikhand. Shrikhand looks yummy and tempting. Healthy and yummy, great click too..
this is delicious and perfect.. Love the use of greek yogurt.. will try this soon!! This sounds like a wonderful, refreshing and tasty dish; the saffron add a lovely color too. 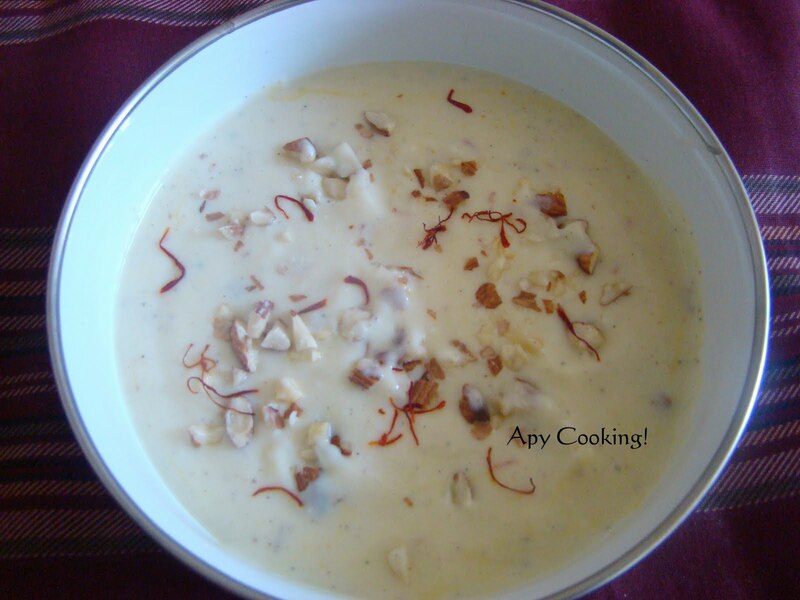 yummy and droolworthy shrikhand...I've posted shrikhand recipe too last week..
Yummy Aparna! Shrikhand is a great low cal dessert I enjoy eating anytime, specially with nuts.Muddukrishnas are very cute at certain ages and become real naughty Balakrishnas as they grow:-)) Good luck Mom!! I know shrikhand is pretty yummy and terrific. But my friend had told me tat its very time consuming, that you need to keep churning hte curd and all that. Your recipe seems easy and shd be worth a try..